A supertree method is a form of meta-analysis. It combines phylogenetic tree estimates, which typically include only a subset of the species of interest, into a single tree that includes every species found in any input tree. These methods are usually applied to phylogenetic estimates that only have taxonomic labels at their leaves. Taxonomies are another source of information about phylogenetic relationships. They usually convey names for groups of species in addition to species names. If a taxonomy places every species, then its phylogenetic information can be fully expressed as a tree. Such a taxonomy could easily serve as one of the inputs to a supertree method. However, most taxonomies contain incertae sedis taxa, which are species or groups of species that have an uncertain placement within the taxonomic hierarchy. Here, we review some principles of building trees from splits and describe a supertree method that is able to handle incertae sedis taxa without losing taxon names. The authors thank Dr. Karen Cranston for comments and the NSF (awards 1759838 and 1208393) for funding. MTH would like to thank Dr. Bernard Moret. 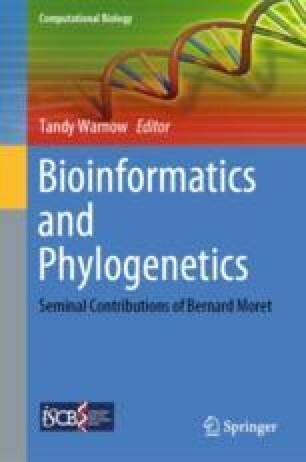 Dr. Moret’s leadership of the CIPRES project was crucial to MTH’s early career, and Dr. Moret’s career consistently served as an inspiring example of integrating the discipline of computer science with evolutionary biology.